It breeds from the southwestern United States and Mexico south to Bolivia, Brazil and central Argentina. It is fairly common on Trinidad, and there have been recent sightings on Tobago. 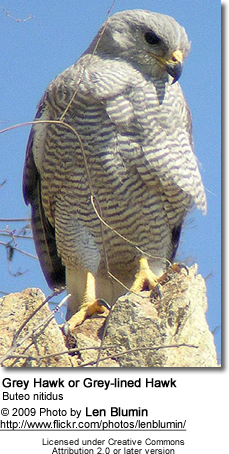 The Grey Hawk is 46–61 cm (18–24 in) in length and weighs 475 g (16.8 oz) average. The adult has a pale grey body, the tail is black with three white bands and the legs are orange. The population southeastern Pacific Costa Rica to Brazil and Argentina has fine white barring on the upper parts; the northern population is darker overall and uniformly grey above. 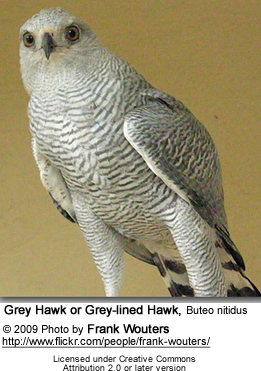 It is sometimes split as the separate species Buteo plagiatus (or Asturina plagiata; the Grey Hawk proper), but the vocalisations of the "grey" and the "grey-lined" populations are identical. Immature birds have dark brown upperparts, a pale-banded brown tail, brown-spotted white underparts and a brown streaked buff head and neck. This species is quite short-winged, and has a fast agile flight for a Buteo. The call is a shrill whistled kleee-ooo. Buteo nitidus feeds mainly on lizards and snakes, but will also take small mammals, birds and frogs. It usually sits on an open high perch from which it swoops on its prey, but will also hunt from a low glide. The nest is of sticks and built high in a tree. The usual clutch is one to three, usually two white to pale blue eggs. The young take about 6 weeks to fledging. When Buteo plagiatus was still considered a good species, it was also listed as Least Concern by the IUCN. In the 2007 Red List, it is united with B. nitidus. BirdLife International (2008). Buteo nitidus. In: IUCN 2008. IUCN Red List of Threatened Species. Downloaded on 01 August 2009. E.g. Baillie et al. (2004), BirdLife International (2004b). BirdLife International (2004a). Asturina nitida. 2006. IUCN Red List of Threatened Species. IUCN 2006. Retrieved on 05 December 2006. BirdLife International (2004b). Asturina plagiata. 2006. IUCN Red List of Threatened Species. IUCN 2006. Retrieved on 05 December 2006.